The presidential pardon process can be intimidating for anyone seeking clemency, a commutation, or a pardon. Fortunately, the bare-bones basics of the presidential pardon process and application are relatively simple. 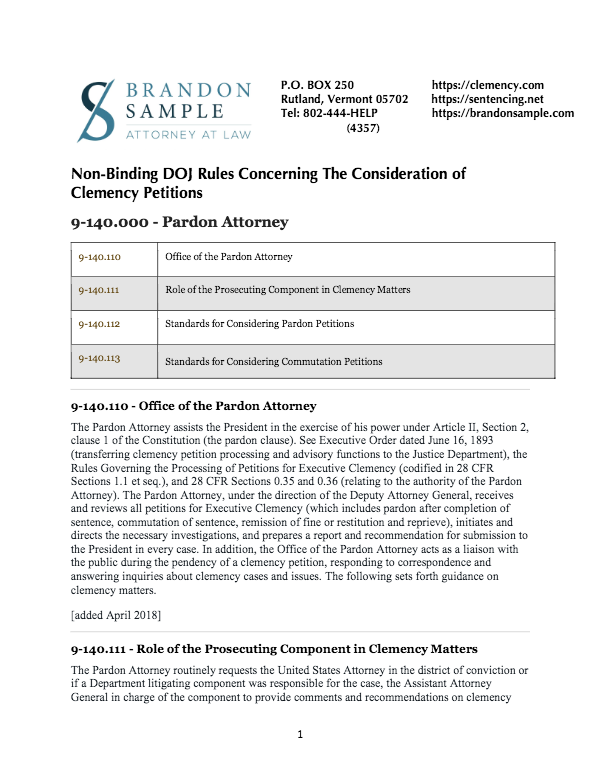 Although the process of simply requesting a pardon may seem simple, there are a number of pitfalls to avoid and some serious consequences for submitting a half-baked presidential pardon application. This article is intended to give a basic introduction into presidential pardons. If you are interested in seeking a pardon for a state crime conviction you should view other resources available on this website. Requesting a pardon from the President requires you to provide extensive documentation that demonstrates why your circumstances present a compelling case for obtaining official forgiveness from the President. The presidential pardon process appears technically simple, but your ability to actually obtain any clemency or pardon hinges on how well you can navigate the application, provide extensive supporting documents, and persuasively present your case for why you deserve official forgiveness. As we've written before, the official application for a presidential pardon is fairly short- 28 pages including the instructions from the Office of the Pardon Attorney. These application and instructions can be thought of as the Rulebook that applies in the presidential pardon process. In order to apply for a presidential pardon, you must first make sure that you meet some basic requirements. First, only federal crimes can be forgiven by clemency from the U.S. President. This means that the presidential pardon process does not apply to any convictions for state crimes. You can find more information about the process of obtaining forgiveness for your state convictions elsewhere on our website in soon to be published content. Second, you cannot apply for a pardon until the five-year waiting period has run in your case. The five year waiting period starts on the day you were released from BOP confinement. If your particular sentence did not require you to serve any time in BOP custody, the five-year waiting period begins on the day you were sentenced. If you previously went through the presidential pardon process, submitted a formal application, and been denied relief you will face another hurdle before applying again. Once your clemency request is denied, you cannot submit another request for clemency for an additional 2 years. Although it may be tempting to fire off a clemency petition that you prepare yourself on the fifth anniversary of your release, a denied application has real consequences. This rule makes it even more important that you put your absolute best foot forward with the most compelling clemency petition you can present. Your ability to demonstrate a productive and law-abiding life must be thoroughly described in the application. The clemency application is very thorough and requires attention to detail. Of course the application asks routine questions about your address, identification, and the underlying conviction that you are seeking to have forgiven. You are also required to provide a full criminal history and arrest record as part of the presidential pardon process. It does not matter if the arrest did not result in an actual conviction; you still must provide the information. This requirement includes any juvenile convictions or arrests which might otherwise be sealed under state law. If they exist, you must disclose. You are also required to provide detailed financial information to the Office of the Pardon Attorney. This includes answering questions about your credit status, debts, and if you have been involved in any civil lawsuits. Your financial status and stability is just one factor that the President considers when evaluating your clemency petition.This information is certainly invasive, but you are required to give it if you want to ask for executive clemency. You must provide character references from other people who can vouch for your good character as part of the presidential pardon process. There are generally no rules about who can provide these character references, but there is a specific form that must be used that is included with the application itself. Broadly speaking, character references will be given more weight the longer someone has known you. It is always helpful to be able to include character references if possible from community leaders. This includes pastors, your employer, elected officials, and other prominent people in your area. If a you are seeking a pardon from a military conviction, the application must be sent to the Secretary of the military branch that had original jurisdiction in the case. This means that if you are seeking to receive executive clemency forgiving you for a conviction that you received while serving in the U.S. Army, you must send your application to the Secretary of the Army. Military clemency petitions are highly specialized and we absolutely recommend that you do not try to submit your petition without the help of a qualified attorney. It should go without saying that lying, stretching the truth, or making false statements when asking for official presidential forgiveness is a terrible idea. If you are trying to demonstrate that you have changed for the better in the time since your conviction then lying is not going to help you. At worst, if you are caught lying in your clemency petition you may be facing a new prison sentence. At best, you will have made sure that you will not ever be able to receive a pardon. Any false statements on a pardon application may result in a heavy penalty. An individual can be convicted up to five years imprisonment and a $250,000 fine for making false statements in the presidential pardon process. When preparing a clemency application, you need to keep in mind the effect that a pardon might have and what a pardon really means in practice. If you are going through the presidential pardon process, you were at some point convicted (whether rightly or wrongly) for breaking federal law. The vast majority of people seeking executive clemency have previously spent at least some time incarcerated also. A presidential pardon is a sign of official forgiveness issued by the United States Government, potentially, to you in light of all of the facts that you present in your clemency petition. When your clemency petition is being prepared it is always important to keep this basic premise in mind. Unless you were convicted for a crime in military courts, your clemency petition should be submitted to the Office of the Pardon Attorney (OPA). If you were convicted of a military crime you must also send the petition to the Secretary of your former branch of service. Once your petition is submitted, the OPA will review your materials and conduct an independent investigation. The investigation includes reviewing all documents submitted, character references, and the nature of the crime being considered for pardon. The OPA is in charge of reviewing all petitions for clemency including pardon requests, commutations, and reprieves. Staff attorneys who work full-time in the OPA will direct the investigation into your petition and prepare a report for each request for the Deputy Attorney General. After an investigation, the OPA will recommend whether or not a petitioner should be granted a pardon by the President. When and why the OPA recommends that your pardon application should be granted is governed by . Ultimately, the Pardon Attorney is responsible for determining if you meet the standards for recommending favorable action on your clemency petition. The OPA will look at your post-conviction conduct as well as your general character and reputation of the individual. The OPA is also required to evaluate the offense of conviction, factoring in its seriousness and how recent the offense took place. Additionally, your individual situation will be considered as well as your personal need for the executive clemency you are seeking. After this investigation, the OPA will make a recommendation to the Deputy Attorney General who in turn will pass this recommendation along to the president. The president holds exclusive authority to grant any type of clemency. There is no hearing held on the pardon application, either by the Department of Justice or the White House. There is no appeal process. The OPA will not disclose any information regarding the nature of their investigation. They will not tell you (or your attorney) where they are at in their investigation other than stating their investigation is ongoing. Even more frustrating, is the policy of the OPA that they will refuse to disclose any specific reasons why your clemency petition was denied. All documents pertaining to these decisions are confidential and not generally subject to disclosure under the Freedom of Information Act. Recent history demonstrates that most Presidents have required pardon applications to be first processed by the Office of the Pardon Attorney before the President makes a decision. But the DOJ's clemency rules are not binding on the President. The President has the authority to grant clemency as the President deems fit consistent with the President's broad constitutional powers in this regard. Nonetheless, the presidential pardon process for most applicants will continue through the DOJ's normal rules for consideration of clemency requests. A consideration that is not listed officially is the political considerations of granting a pardon. Pardons are heavily scrutinized by the public. Most recently, President Trump granted his first pardon of his presidency to Joe Arpaio. Arpaio is the former Sheriff of Maricopa County in Arizona. Arpaio was sentenced to six months in jail for criminal contempt. Arpaio defied a court order that ordered him to stop detaining immigrants based solely on the suspicion of their immigration status. The move came late on a Friday night. Many people were upset about the pardon, but President Trump did not exceed his authority. There have been many controversial pardons throughout the years. President Clinton pardoned his half-brother. President Ford pardoned his predecessor, President Richard Nixon, after Nixon resigned from office after being impeached. The president's power to grant or deny clemency is extremely broad and unrestrained. The presidential pardon process can be confusing and hard to decipher even with the help of an experienced attorney. You can find more information about presidential pardon process and executive clemency in general throughout our website. If you or a loved one is looking for help with requesting clemency or a pardon, please contact Brandon Sample, Esq. by calling 802-444-HELP (4357) for a free consultation, or submit an online request for a free consultation.